The final day of Shree Swaminarayan Temple New Jersey's Dashabdi Mahotsav had arrived. On Sunday, August 7th, 2011, His Divine Holiness Acharya Swamishree performed the 10th annual Patotsav ceremony to the murtis of Lord Swaminarayanbapa Swamibapa. The Lord had been giving His divine darshan and granting salvation to those who visit Shree Swaminarayan Temple New Jersey and experience its serenity for ten years. His Divine Holiness Acharya Swamishree performed Mangala Aarti at 6 am. Almost immediately afterwards, He began the Patotsav ceremony, starting off with the murtis of Shree Ganpati and Shree Hanumanji. Acharya Swamishree then performed the Patotsav ceremony to the divine murtis of Lord Swaminarayanbapa Swamibapa in the sinhasan. Acharya Swamishree used flowers made from real gold in the ceremony, which was very appropriate for the occasion, seeing that the Suvarna Tula ceremony (gold-weighing ceremony) of the idols of Lord Swaminarayanbapa Swamibapa was performed one decade ago before the murtis were installed in the sinhasan. After the Patotsav ceremony, sants and disciples arranged a lavish annkoot to offer to Lord Swaminarayanbapa Swamibapa. As the annkoot was being arranged, Acharya Swamishree performed the flag-raising ceremony, replacing the pervious year's Shree Swaminarayan Gadi Sansthan flags waving on top of the three grand sikhars on the temple's roof with new ones. The Secaucus fire department assisted in raising the flags, and Swamibapa Pipe Band performed during the ceremony. Upon reentering the temple, the annkoot was revealed. Many different types of sweets and fruits were delicately arranged in front of the divine murtis of the Lord. Acharya Swamishree blew the ten candles out on the Dashabdi Mahotsav celebration cake and offered some cake to Lord Swaminarayanbapa Swamibapa. Sants and disciples then took turns performing aarti to Lord Swaminarayanbapa Swamibapa on this auspicious day. Acharya Swamishree was then escorted to Swamibapa Hall by Swamibapa Pipe Band, where the congregation had assembled after aarti. Several honored guests, including Secaucus Mayor Mike Gonnelli and other city and county councilmen who have been friends to the temple for the past decade and even longer, had come to Shree Swaminarayan Temple New Jersey for Acharya Swamishree's divine darshan. They were also escorted into the hall by Swamibapa Pipe Band. Acharya Swamishree presented them with flower garlands, prasad saals, and Dashabdi Mahotsav momentos. Mayor Mike Gonnelli has been a friend to the temple congregation for the past 24 years, and to express his gratitude for being able to be acquainted with such a divine personality such as Acharya Swamishree, he gave a wonderful speech and presented a few special gifts. The mayor presented a plaque of honor and a large key to the city of Secaucus to Acharya Swamishree. This was the first time the mayor had ever presented the key to the city to anyone. The mayor also presented a few "mini keys" to the city to Sant Shiromani Shree Dharmavatsaldasji Swami and some of the temple's leading disciples. After the honored guests had departed, Acharya Swamishree showered His divine ashirwad for the last time during the Dashabdi Mahotsav. Acharya Swamishree preached about keeping one's heart clean and pure for the Lord to reside in. Lord Shree Swaminarayan has given us the opportunity, a one in an 8.4 million chance, as a human avatar to achieve eternal salvation. This avatar is a rare opportunity, especially for those who are born into the Karan Satsang. 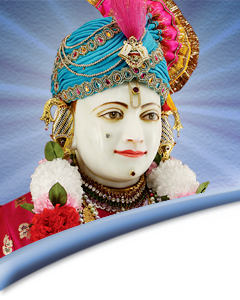 Lord Shree Swaminarayan is not bound by anything, except by His love for His disciples. This love is one of the main reasons He came to this earth from Akshardham. As an individual has wife and kids and calls it his family, the Karan Satsang is a family of Lord Shree Swaminarayan, Jeevanpran Shree Abji Bapashree, and Jeevanpran Shree Muktajeevan Swamibapa. In the family of the Karan Satsang, everyone must work together to reach the common goal of eternal salvation and pleasing Lord Swaminarayanbapa Swamibapa. We are all His children, so we should never be envious and jealous of each other. God has given us all different skills and talents to put them all together and work as one. If one looks within his soul and finds virtues, he will perceive virtues in others; but if he is evil-minded, he will only faults in others. A disciple who always perceives virtues in others is in a different state of mind than others. The Lord becomes extremely pleased with such a disciple. Such a disciple never contravenes the Lord's commandments. If a Satpurush or a sant reprimands a disciple in order to keep him adherent to the commandments of God, the disciple has understanding and realizes that the Satpurush is rebuking him for his own good. The body is your harddrive to store all kinds of information through 5 gnan indriyas input. We must filter the information coming in to keep our hearts clean for God to reside in. The 4 antah-karans (Man, Buddhi, Chitt, Ahankar) are the 4 agents that feed the five gnan indriyas. To cleanse your body and heart, one must associate with a Satpurush and His sants. Without having the knowledge of the Lord's greatness, it is hard to achieve eternal salvation. Shreejimaharaj said that one must never speak with cowardice, which would cause others to become weakened in their pursuits to please Him. Whoever does is an evil and impotent person. When Acharya Swamishree's ashirwad concluded, leading disciples from the various mandals around the globe (USA, UK, Kenya, etc.) came together and presented Him with a large Dashabdi Mahotsav momento on behalf of the temple congregation. Acharya Swamishree stood up on His gadi and bestowed His divine darshan upon the entire congregation. The kirtan "Swamibapa Pyaara" then began to play in the background, and Acharya Swamishree began to dance immediately whilst standing on His gadi. Sants and disciples crowded around the gadi to cheer Him on and dance along. Sants then circled around the gadi and lifted it off the ground with Acharya Swamishree still standing, and He joyously continued to dance. The sants carried Acharya Swamishree, still on His gadi, off the stage and all the way back to the temple prayer hall, singing praises of the Lord all the while. It was a wonderful finale to the Mahotsav. The Dashabdi Mahotsav could not have ended on a better note. Everyone was then served maha-prasad, and this concluded the four-day Dashabdi Mahotsav of Shree Swaminarayan Temple New Jersey. Lord Swaminarayanbapa Swamibapa has bestowed His divine darshan and granted salvation to all those who visit His abode in Secaucus, New Jersey, for the past ten years, and He will continue to do so forever. The past ten years have been a fantastic and memorable decade of devotion, unity, and service; and those who visit the temple and partake in its activities will forever be able to experience this magic by the infinite blessings from Lord Swaminarayanbapa Swamibapa in the temple.